I am excited to be working with some different Scentsy consultants from all over! 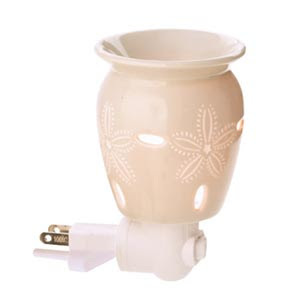 Thanks to Lani with Scentsy I got to review the Sand Dollar Plug In Warmer. I love the detail on it and the color of it! It will go perfect in any room and I love that! I also got some Scentsy bars and love those too! Thanks to Lani with Scentsy I get to give one lucky winner the plug in warmer shown here and a Scentsy bar. How cute is that! Please enter me! Allright...another chance! I would LOVE to try a scentsy warmer! This would be great for our bathroom! Told about this on my Facebook too! And I also have your button up! I have wanted a Scentsy warmer for the longest time-thankyou for the chance! I love Scentsy--I would love some new stuff. I need some good scent going on in my scrappy schoolhouse! This would be great to have in my home..scents make a house a home! i have your button already! I love smelly things. I bet these are great. Hi! I'm a follower of your blog. Thanks for the chance to participate in the giveaway contest. the hall closet with everyone's sneakers. Thanks for the chance to win. I have something similar and I love these things.Great product! Love the Scentsy and would love to try a plug in. I would love to have my house smell nice all the time! Great giveaway! I'd love to win this. Love it! so cute and would love to try scentsy out! I won a Scentsy warmer months ago, and never received it. I'd love one. Please count me in. Thank you!